The German Shepherd Dog has a relatively short history as a separate breed of dog. Over 100 years ago, Captain Max von Stephanitz, of the German Calvary, resigned his commission in the German Army to pursue a career in farming. The Captain had always wanted to be a sheep farmer. Now he had a problem. To shepherd the sheep, you needed a dog that could help. The dogs of that time were somewhat small and not able to control some of the more stubborn sheep of the flock. Max von Stephanitz set about looking for the type of dog he thought would be best suited for herding his sheep. He wanted a dog that was powerful, intelligent and one that and possessed endurance. Stephanitz went to a show in Karlsruhe in western Germany and a medium-sized yellow-and-gray wolflike dog caught his attention. This dog was already a working sheepherder, that had this trait already ingrained. This meant that this dog would require little training other than some direction and polish to become an excellent sheepherder. This dog became the first registered German Shepherd Dog (GSD). His name was Hektor Linksrhein, however when Captain von Stephanitz purchased the animal he renamed it Horand von Grafrath. Von Stephanitz went on to found Verein fur Deutsche Schaferhunde, SV which translates to German Shepherd Dog Club. He was the first president and had specific standards for the breed which he implemented. His goal was to develop a breed based on mental stability, intelligence, watchfulness, reliability, together with courage, fighting determination and a sound temperament. The Captain had a motto that was "Utility and Intelligence" and to him beauty was secondary. A breed standard was developed dictating the exact purpose, relationship and the structure of this new breed. It was Captain von Stephanitz who standardized the look and type for German Shepherd dogs throughout the world. As Germany became more and more industrialized and the rural areas were declining, von Stephanitz thought his breed might also decline. With the cooperation of police and working dog clubs, a set of specific tests were developed in tracking, formal obedience, and protection work. This was the prototype of the present day Schutzhund trials. Schutzhund means "protection dog", and this reflects the expectations that von Stephanitz had of his beloved German Shepherds. There are three phases of Schutzhund - obedience, tracking and protection. Captain von Stephanitz made it a requirement that to breed German Shepherds they must first demonstrate their ability to work. To do so a Schutzhund title was necessary to be allowed to breed. The Verein fur Deutsche Schaferhund also had conformation shows, known as Sieger Shows. This is where the dogs are rated G (good), SG (very good), V (excellent), or VA (excellent select). The World Chanpions would receive a VA 1 rating. This new breed, the GSD would also be required to have a hip certification to reduce the possibility of a hip disease. The Verein established a stud standard immediately when it was founded. It’s purpose was to control which dogs could be used for breeding, who could be bred to whom, age limitations, and the number of puppies that a breeder could keep and raise. For a litter to be officially registered in Germany, both parents had to have Schutzhund titles and at least a G (good) conformation rating. 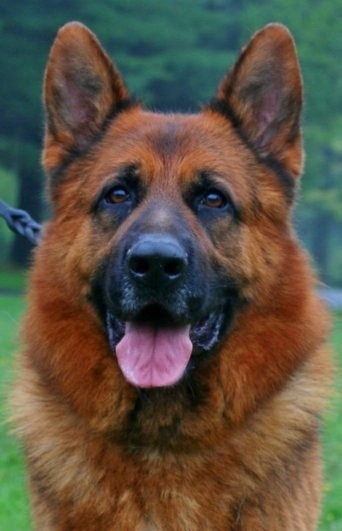 There was much control implemented by the Verein, and only the best was bred to develop the line of German Shepherds. Between 1899 and 1914, von Stephanitz, the Verein and the breeders of the German Shepherds, demonstrated the superiority of their dogs in the areas of protection, tracking and obedience. They would sometimes donate certain dogs to the police and sometimes would sell puppies to be trained in rescue work. The first GSD shown in America was in 1907. Mira von Offingen was imported by Otto Gross. In 1913 the first championships were awarded to German Shepherd Dogs in America. In 1913 the German Shepherd Dog Club of America was formed by Benjamin Throop and Anne Tracy, and had 26 charter members Their first GSD show was at Greenwich, Connecticut in 1915. In 1917, when America entered World War I, all things German became undesirable. The American Kennel Club switched the name of the breed to the Shepherd Dog and the German Shepherd Dog Club of America became the Shepherd Dog Club of America. In WW1 the German Shepherd was used by the German Army as search and rescue dogs, guards dogs and messengers. They were even used as ammunition carriers. The German Army was impressed with the versatility and dependability of these dogs. During World War 1, German Shepherds demonstrated their ability to do just about anything, they would go anywhere, and their courage impressed not only the German soldier, but the English and American soldiers as well. Close to the end of World War 1, an American soldier came upon a German bunker, and found two German Shepherd puppies whose mother was no where to be seen. This soldier brought the two puppies home to America. One of the puppies died unfortunately, but the other grew up to become one of the most loved German Shepherd Dogs in the history of the breed, Rin Tin Tin. Now the intelligence and striking appearance of the dogs caught the awareness of the general public. The status of the breed exploded with the introduction of Rin Tin Tin and Strongheart as stars of their own movies. To meet the new demand, German Shepherd puppies for sale flooded the American market. Subsequently the quality of German Shepherd puppies declined, resulting in the breed becoming much less popular. This amounted to fewer German Shepherd puppies for sale, however the quality of these German Shepherd puppies for sale was greatly reduced. World War 2 became a part of the German Shepherd Dog's history as well. Again, this dog demonstrated its ability in a wide variety of tasks including mine detection, messengers, guard work, and other services. They were even used by the Red Cross to find wounded soldiers. The GSDs were praised by soldiers of all sides of the battle and at the end of World War 2 another flood in popularity struck the German Shepherd breed. The GSD became the number one breed being bought, sold and registered in the United States. With the number of German Shepherd puppies for sale, the price of popularity was again to raise it’s ugly head. Because of the uncontrolled breeding practices, more defects became noticeable to the public. There were many instances of dog attacks being reported and the GSD was given the reputation of a violent, destructive and uncontrollable dog. Actually this was the result of some bad breeders that changed the dog’s temperament by breeding low quality dogs with similar low quality dogs. These breeders mass produced the puppies and did not care to socialize the puppies properly. Some medical problems started to add to the expense of owning a GSD. Hip dysplasia, cataracts, elbow dysplasia, and epilepsy became common in some bloodlines. On the other side of the coin, were the reputable, responsible and caring breeders who really loved the breed for what it originally was meant to be. They wanted to keep the GSD strong, and most importantly the breed still needed to satisfy the original ideals of von Stephanitz's motto "Utility and Intelligence". Sincerely dedicated breeders since that time have fought to return the temperament and the strong body of the GSD to what it was in the beginning. It is imperative that a prospective new owner of a German Shepherd meet the expectations of the breeder and the dog. High standards must be kept, to safeguard and defend this most magnificent animal from deteriorating over time. Today’s GSD is much the same as Captain von Stephanitz envisioned. This is a dog that has been developed to a point of almost perfect fitness for the work he is called on to do. The German Shepherd is a dog of medium size, heavy enough to be valuable as herder, search and rescue worker, seeing-eye dog, or as a police dog, but not too heavy to be massive or uncontrollable. The impression of the dog as a whole is one of ruggedness combined with nobility, of power combined with agility. Overall this is a breed that, with it’s many uses, is also a constant companion that is fiercely loyal to it’s owner. We now accept Credit Cards or PayPal . There is a 3.5%fee for PayPal and Credit Card purchases. No extra charge for checks or cash.